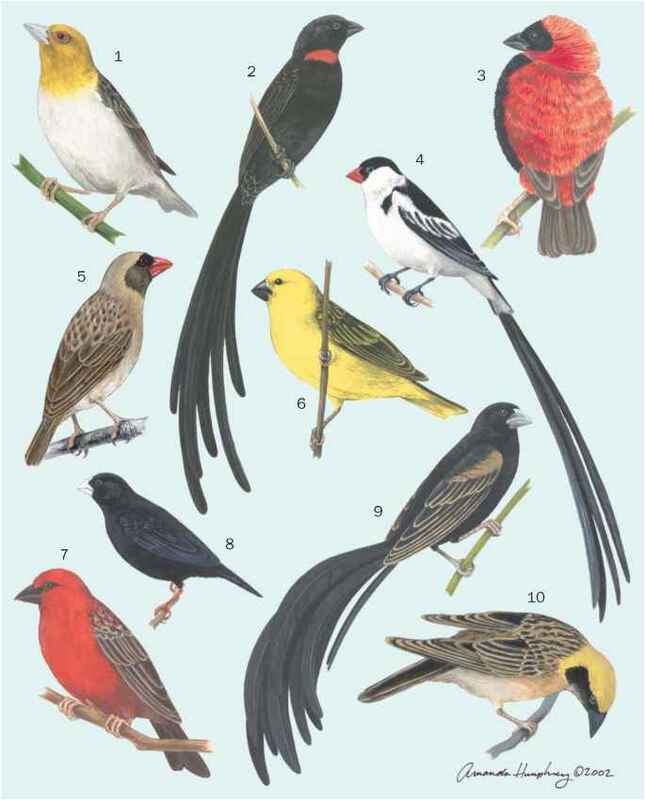 The species of true finches range in body length from 4-10 in (10-25 cm) and in weight from 0.3-2.1 oz (8-60 g). The shape and structure of the beak can vary enormously within the family, but all are conical-shaped, stout, short, and pointed. The beak is well adapted for holding seeds and removing the outer shell (or seed-coat). The true finches also have rather small outer primaries on their wings, and these are entirely concealed by the wing coverts. Species of fringillids also differ from the emberizid finches (Ember-izidae) in that the edges of their mandibles fit closely together all along the length of the beak. Some true finches have a par ticularly large beak for dealing with relatively large seeds, for example, the evening grosbeak (Coccothraustes vespertinus). Other species have a smaller beak with crossed mandibles adapted for extracting seeds from conifer cones, such as the red crossbill (Loxia curvirostra). Plumage coloration varies widely among species of fringillids. Species may be brown, yellow, grey, orange, or red, and they may be patterned with spots, patches, or streaks. Most species are dimorphic, with males often being more brightly colored than females.